As the days grow longer and the temperatures warm, staying inside and cleaning may be the last thing on your mind. But, taking some time to do tidy up and do some inspections of your home will help transition and usher in the new energy of the season, bringing a lightness and joy to your home and your life. 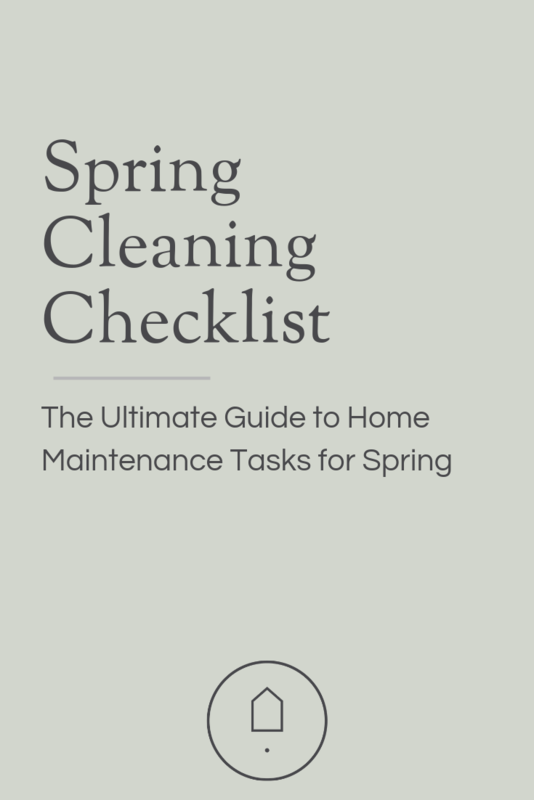 Checking off home maintenance tasks now will also also ensure you can enjoy the busy days of spring and summer, and know your home is in good health. A few simple tasks now can prevent costly repairs later, saving you time, money and stress! Take some time to review this checklist, determine what applies to your home, and block off some time to get started! Pull out that ladder and remove any leaves or branches from the gutter, making room for spring rains to easily drain. Even if you don’t think you need to, and skip this, I guarantee you’ll find yourself with a clog when it’s pouring rain, you’re just dressed for work, or it’s the middle of the night and you’re ready for bed. Because that’s how things work. Trust me, I know. While you’re up there cleaning the gutters, take a peak at the roof. Winter storms can take cause damage without you knowing it. Look for missing shingles, pipes or venting that is damaged or missing, or anything that just doesn’t look right. Have a hard time seeing? Use a selfie stick to do a video, or check to see if you can step out on a neighbors yard, balcony or porch for a better view. Wood decks, fences, pergolas and other outdoor structures will last longer if they are stained or resealed every year or two. If you plan on doing any exterior painting, now is the also the time to do so! While you’re inspecting your wood and the home’s exterior, check for signs of termites. They swarm in the spring. If you see any of the flying insects, or signs of damage, call a pest inspector right away. Take a walk around your home and check walkways, paths and driveways, for damage caused by freezing and thawing. Schedule repairs if needed before cracks or holes get worse! Clean storm windows before storing them away and wash any winter grim away before placing screens on windows. Make sure there are no holes, as even small tears can let in bugs! Prevent mosquitoes from breeding by looking around your yard for standing water. Dump any buckets, make sure rain barrels have tight screens, and use non-toxic “mosquito dunks” (found at hardware and garden stores) in ponds. Just like how you notice that gutters are clogged while it’s raining, an air conditioner is bound to go out when it’s a sweltering 90 degrees. Change your filter and schedule an inspection with your HVAC professional for an inspection and tuneup. If you do nothing else, do this! After a long winter of being close up, your home wants to breath! Fresh air revitalizes a home and clears out stagnant air, smells, and germs. Lint, shed skin, animal dander, wood ash and fur has been trapped inside all winter. Give all surfaces a cleaning! After a winter of tracking in all that snow and a mud season of, well… mud, you’ll love having a fresh, clean start. Because flowers make everything better. Force some forsythia, cherry or quince branches, or pick up some bundles of daffodils at the market. In warmer weather, ceiling fans should rotate counterclockwise to push cool air down to the floor. Clean your mattress by sprinkling with baking soda then vacuuming, and rotate. Switch out the heavy down comforters and flannel sheets for lighter cotton and linen. Make sure to clean winter bedding before storing away. Now that your spring cleaning and home maintenance inspections are done, it’s time to enjoy the nice weather! Anything I forgot? Leave me a comment and let me know! Still winter in your part? Make sure to pin this post for later!